Accessing services over the internet isn’t a new idea, but the pace with which cloud computing is spawning new technologies and solutions is accelerating. In recent years, cloud-based services have reshaped the way business models are planned, saving costs and improving efficiency. As business IT needs expand and data accumulates, the cloud is producing new ways to handle the increasing demand for fast and flexible systems. The benefits that cloud computing provides can transform the companies that choose to implement it. 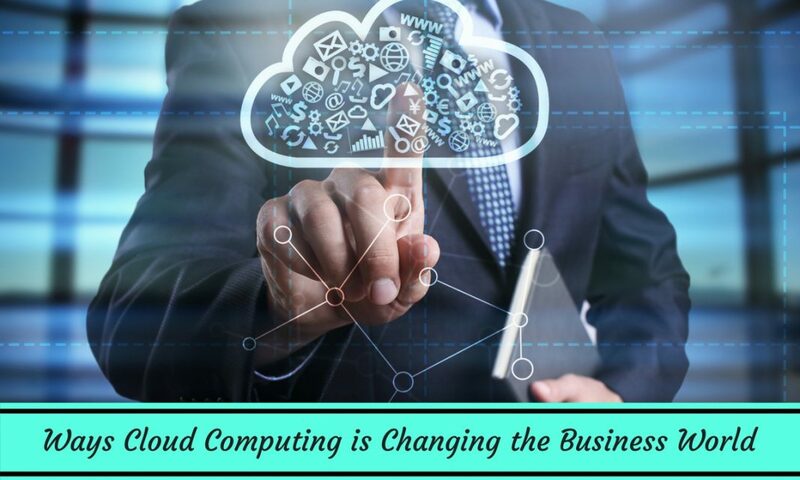 Cloud computing for business is very important as it offers companies new options to improve their innovation, time-to-market their product or services along with organizational efficiency. Many file sharing apps offered today include features like automatic updates, alerts, notations, meeting invitations, and versioning histories. Having such productivity in one central which is accessible to designated team members makes it easier for large teams to collaborate more closely. They can work with an up-to-date set of plans and documents regardless of when and where they access the centralized file share. More effective teams lead to greater productivity on any project without having to worry about time zones, individual schedules, or waiting for approvals. With the growing range of services available, companies of any size can move some or all of their functions from the local network to the cloud provider’s servers. You can typically pick and choose a selected group of services, from data storage to bookkeeping. The advantages of using a third-party service is that the provider is responsible for system maintenance and upgrades, minimizing the risks of application crashes or downtime, and protecting data. Smaller businesses get access to software and hardware resources that would be straining their budgets to purchase for themselves. This allows them to utilize the same sophisticated computing tools that big corporations deploy. Financial demands that normally limit small or medium businesses to their own local area networks can now be scaled from the start to utilize global networks and remote resources without the expense of additional IT overhead. With cloud computing this can be done rapidly, without any need for purchasing and installing data centers at distant locations. Rather than taking time and trouble of developing and expanding your in-house IT infrastructure, you can also purchase infrastructure-as-a-service (IaaS) from their provider to support their own custom IT needs. Cloud computing can benefit larger enterprises by allowing a segmented, modular approach to business functions. Cloud technology enables stronger and more productive teams through file sharing and real-time communication over secure virtual networks. This allows corporate structures to be less complex and hierarchical. Separate and distinct functional entities ensure that high-level misjudgments don’t have a negative domino effect across the organization. Centralized data that is available to selected teams or departments allows everyone to operate from the same current information. Anyone with a need to know can simply be granted access privileges. There’s no more need to worry over lost time in delayed responses to phone calls or emails. There is reduced need for constant progress reports, travel time, or the likelihood of idle gossip and chitchat. Information sharing saves time, which boosts productivity and saves cost. One of cloud computing chief advantage is that it’s very cost-effective. Businesses who choose to use remote hardware and services can reduce their own infrastructure investment. These savings come from both reduced IT staffing and investment in hardware. For most IT departments, it’s necessary to maintain a network staff to see that in-house systems are properly installed, monitored, and updated. But outsourcing means that a cloud provider takes care of deploying, managing, and upgrading your systems as required. This lowers the burden on IT departments so that they focus on more important duties. Smaller organizations can reduce IT staff significantly and still pursue new technical projects. Access to cloud servers allows all companies to reduce any investment in hardware that will only become obsolete every few years. The costly support for in-house equipment and upgrades is passed on to third-parties and their own data centers. Client companies can use their funds to re-invest in other ways. Access to remote services allows data to be readily shared across the organization, so that workloads and responsibilities can be distributed more productively. The easy deployment and integration of cloud computing creates an environment that allows businesses to be more agile and innovative, but with lower financial risk. Incorporating cloud services at an early stage benefits entrepreneurs by lowering the need for IT costs and freeing up more operating capital. The growth of cloud computing is helping to stimulate entrepreneurship. Cloud services also support cross-platform APIs, making it easier for you to integrate with a variety of partner systems. Independent businesses of all sizes reduce their infrastructure costs by integrating with a much more powerful and reliable third-party infrastructure. Most providers charge on a sliding scale, so that smaller businesses can have access to services and resources they couldn’t otherwise afford, but can purchase additional resources as needed to align with company growth. This can save organizations considerable investment over time, while enabling the ongoing ability to forecast IT budgets and expenses that are coming from one provider. Online data storage can provide a number of options in hardware, such as extensive data caching or fast solid-state drives. Cloud providers allow you to access top quality hardware expertly configured for internet access. While every company has different staffing and software needs, a robust third-party platform can provide faster data access than even local storage. That’s often true for your employees and certainly true for your customers. Authentication and logging can also take place on the remote server to reduce the load on your local networks. Fast access and fast data exchanges means getting more things done. At one time, cloud computing was associated with heightened exposure to cyber criminals, but the truth is that the cloud provides a more secure form of storage than on-site company servers. Your sensitive data, files, and important documents are stored in one central location, which enables stronger security measures and allows corporate employees to utilize the same sets of data. Company data is more accessible and secure because the information is stored across a distributed network, not on a single physical device. As cloud providers are a client-centric industry themselves, they take extra precautions to see that your data is protected by the latest developments in firewalls and anti-malware. Cloud provider systems are monitored for intrusions so that data breaches are improbable. They enforce restricted user privileges and encrypted passwords so that only authorized persons can access your company files. Cloud providers have architected highly scalable solutions so you don’t have to be concerned with memory or bandwidth limitations. You save money because there’s no need to buy and install additional network storage devices as your business grows and your transaction data piles up. The ability to have employees working from any location ensures that more work is getting done and more problems are being addressed. Mobile devices make it possible for your field teams to access the same cloud-based files and applications that their in-house colleagues are using. With mobile technology, remote employees enjoy the freedom to work on their own terms while still having the capability of real-time communications and updates. Thanks to cloud computing, mobile employees can accomplish more. They no longer have to worry about juggling paper copies of plans, forms, and documents they can obtain online. Even travel delays are transformed from downtime to work opportunities. The internet has provided the world with a communications and informational channel that they can reach anytime and from anywhere via smartphones and tablets. This has led to an increasing business trend of using more remote employees, whether that’s locals working from home or specialists on the other side of the world. An increasingly mobile workforce is one of the main influences in business adoption of cloud computing. More employees are able to work from home or bring their own mobile devices to work. Familiarity with their own devices gives them a greater sense of comfort and confidence. The accessibility of cloud computing resources makes it easy for your remote employees to experience the same benefits they would have when working in the office. More companies are encouraging a mobile workforce because it provides the company with major advantages. Remote employees tend to work longer hours and be more motivated. This translates to higher productivity. Companies also save money on space and utilities by having fewer on-site employees. BYOD (Bring Your Own Device) policies have helped to fuel this trend while saving you the expense of purchasing and supplying workers with company devices. Field teams like sales people and technicians can simply log in to the company network from wherever they are and at any time of day to upload documents, access information, use applications, or synchronize files. Whether employees need to work with company data from a home office or video chat with colleagues hundreds of miles away, cloud computing provides a secure platform for promoting collaboration between in-house and remote team members. Many cloud providers can offer a variety of telephony services, including live chat or texting. Another new trend in digital communication is “chatbots”, or AI software than can communicate with direct customers using a real human voice. Cloud services can provide useful tools to improve your support operations, including fast reporting and integration with CRM systems. Improved communications at higher bandwidth means that your customer support team is able to handle more calls more effectively. Happier and more engaged support teams are becoming more productive, which means they have more time to focus on resolving the issues of each customer. Better customer experiences lead to better word-of-mouth across social media, bringing your company more customers. The manner in which companies interact with their customers has also been changing due to changes in cloud services. The cloud opens up new communication opportunities that provide you the flexibility to respond to customer needs promptly across multiple channels such as chat, text, and email. Customers don’t have to be limited to business hours to ask questions or take advantage of the services you offer. With cloud computing, customer support can be a richer experience. This is made possible by providing them with helpful online solutions such as forums, Q&A websites, video tutorials, webinars, and interactive, personalized applications. Small and even medium-sized businesses usually don’t have the bandwidth to support multiple users and memory intensive applications. The cloud makes it easy to share information and provide customers access to their own membership or sales histories. Multi-lingual applications can also provide international currency, time zone, and measurement translations that make it possible to do business with customers from around the world. Interaction with data is also faster and more reliable if users are able to access data that’s cached on servers closer to them, rather than an original source that might be thousands of miles away. When your interactive tools and high-bandwidth media are outsourced to a cloud services provider, you can be confident that they’ll provide the bandwidth and memory needed to provide your customers with a satisfying experience. Customers get faster file downloads from a robust cloud computing framework. Cloud platforms are more secure and work with all major mobile and desktop operating systems. Cloud services can enable you to interact with your customers regardless of which channel they prefer or what device they use. In summary, cloud computing is a platform that provides a wide variety of solutions to businesses of many sizes in every industry. By hosting your services on their hardware and networks, cloud providers enable more flexibility, cost-savings, modularity, and streamlining of any business function you choose. Faster and more mobile-friendly technologies can provide higher efficiency and productivity than ever before. Cloud computing has become a crucial technology that has forever changed the business world.